Adelaide Williams, 5, checks out some bees with her magnifying glass. Isabella Rodriguez, 4, rolls a beeswax candle. 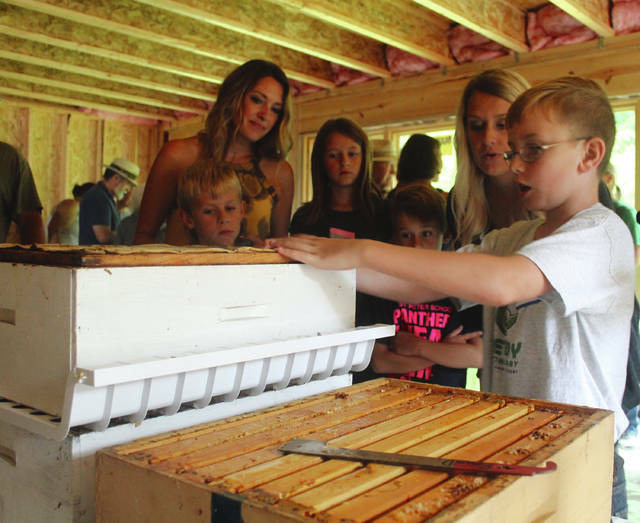 Anna Bolton | Greene County News Visitors joined Greene County Parks & Trails and Greene County Beekeepers Aug. 25 at Russ Nature Reserve in Beavercreek for a honey harvest. Participants checked out an observation hive, rolled beeswax candles, bought local honey and shopped with Bella’s Bee Supply and Berns Garden Center for pollinator-friendly plants. Pictured, Cedarville beekeeper Stewart Kroh, 10, demonstrates the process of extracting honey off a comb. Tom Davidson, treasurer of Greene County Beekeepers, picks up a frame. Visitors joined Greene County Parks & Trails and Greene County Beekeepers Aug. 25 at Russ Nature Reserve in Beavercreek for a honey harvest. Participants checked out an observation hive, rolled beeswax candles, bought local honey and shopped with Bella’s Bee Supply and Berns Garden Center for pollinator-friendly plants. 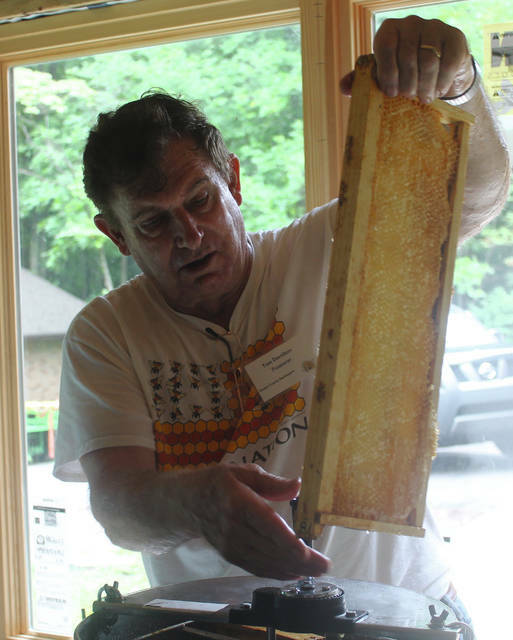 Pictured, Cedarville beekeeper Stewart Kroh, 10, demonstrates the process of extracting honey off a comb. 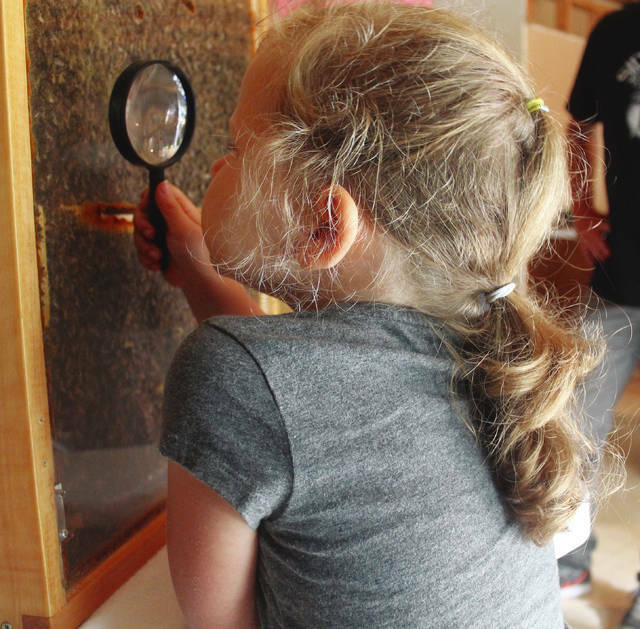 https://www.fairborndailyherald.com/wp-content/uploads/sites/50/2018/08/web1_MagnifyingGlass.jpgAdelaide Williams, 5, checks out some bees with her magnifying glass. 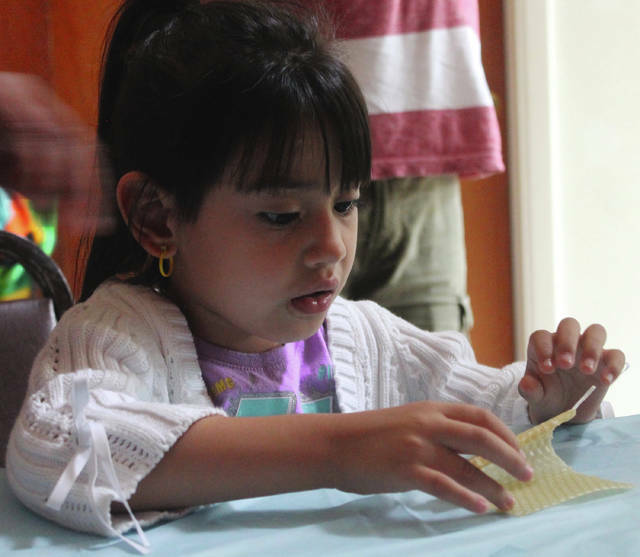 https://www.fairborndailyherald.com/wp-content/uploads/sites/50/2018/08/web1_RollingCandle.jpgIsabella Rodriguez, 4, rolls a beeswax candle. https://www.fairborndailyherald.com/wp-content/uploads/sites/50/2018/08/web1_Stewart.jpgAnna Bolton | Greene County News Visitors joined Greene County Parks & Trails and Greene County Beekeepers Aug. 25 at Russ Nature Reserve in Beavercreek for a honey harvest. Participants checked out an observation hive, rolled beeswax candles, bought local honey and shopped with Bella’s Bee Supply and Berns Garden Center for pollinator-friendly plants. Pictured, Cedarville beekeeper Stewart Kroh, 10, demonstrates the process of extracting honey off a comb. https://www.fairborndailyherald.com/wp-content/uploads/sites/50/2018/08/web1_TomDavidson.jpgTom Davidson, treasurer of Greene County Beekeepers, picks up a frame.